~Mrs. 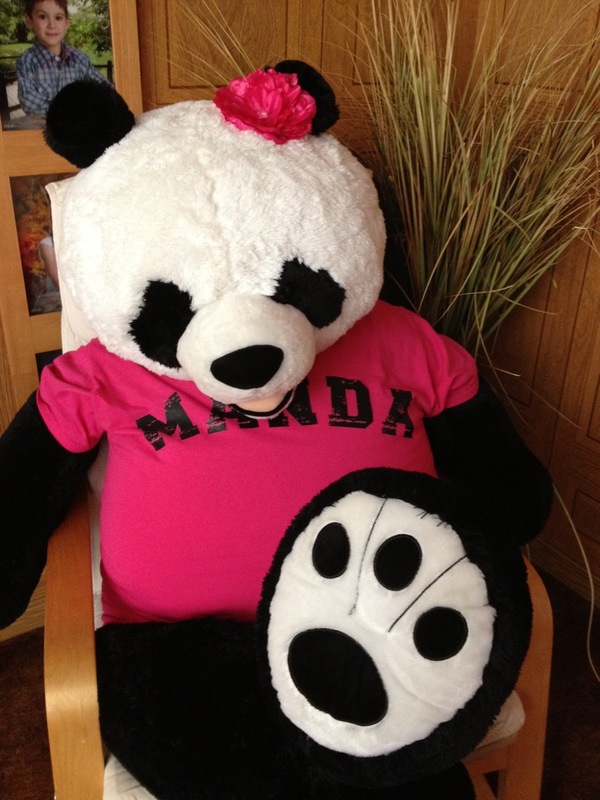 Mathis' Homeroom~: Meet Manda Panda! I can't believe that it's already been a week since I closed the "Name the Panda Contest"! Yikes! It's been busy in our household with our son turning 7 years old yesterday (more on that later!). So you guys voted and the winning name for my classroom mascot is Manda Panda! Maggie Schmerge suggested the name, so she's the one who won a great prize (keep reading to find out what she won)! I wanted to dress up Manda a little, and since her big belly is white (and I want it to stay that way), I thought an oversized T-shirt would be perfect. I bought the pink shirt at Micheal's for only $5 (of course, I got to use my teacher discount, and a coupon!). The transfer letters were a bit more expensive, but still affordable. I cut out the letters I needed and ironed them on easily. Manda is wearing the cool, chic end-result! Oh, I also just HAD to get her that cute little flower clip for her ear! 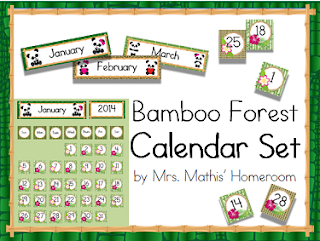 Manda Panda inspired a whole new classroom decor! 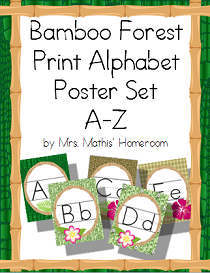 I found this adorable panda clipart from Pixel Paper Prints (on Etsy), classy bamboo background paper from Jazzy Patterns (on Etsy) and these super cute bamboo frames from Painting Fairy Clipart (on Etsy). I knew I had the perfect materials for creating all of my classroom essentials!! 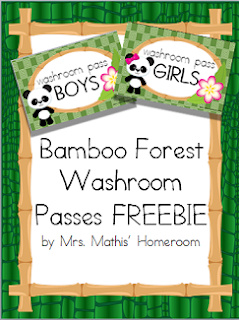 So far, I created washroom passes (FREEBIE ALERT! 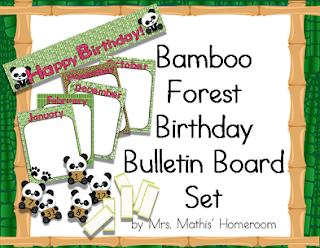 ), a birthday bulletin board, print AND cursive alphabet posters, and classroom calendar. Check them out by clicking on the pictures! What did Maggie win by suggesting the winning name? 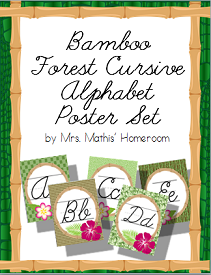 All four of my Bamboo Forest (Panda Theme) Classroom Collection products!! She was thrilled! Do YOU have a classroom mascot? Do you have classroom schedule cards to match your calendar?